Still pictures can be taken in two formats – JPEG and RAW. Most casual shooters will take JPEGS since they are automatically touched up inside the camera and provide pics which are ready to share, email or print. RAW photos capture more actual image information, but require skill and post-processing (work after the pics are downloaded) to get the best results. The Mavic Pro has a narrower field of vision – that is, the angle of the picture is smaller. If we take a picture of a crowd with a Phantom 3 or 4 from the the same distance as the Mavic Pro the Phantom will show more people in the wider shot. Sports action cameras like a GoPro have VERY wide angle lenses – which captures a very large (wide) scene – but will often show fish-eye or other effects. The human eye is closer to the FOV (Field of View) of the Mavic Pro and Phantom. The tighter view means that the Mavic may be better at shooting closer up and more detailed objects. This might include subjects like people (selfies! ), cars, homes, statues, close roof and construction inspections, etc. The Tap to Focus (Mavic Pro only) allows for a greater detail in closer up shots. As an example, if you were shooting a statue and wanted the item in the statues hand (tablets, torch, book) to have greater detail the Tap to Focus would allow you to do so. The Phantom 4 and most all other camera drones have a fixed focus – focus is pre-set which is somewhat of a compromise for close up photography. One potential problem with Tap to Focus is that the pilot has to make certain to Tap (or press the the C2 button on rear of Remote to center focus). This sounds obvious, but it’s easy to forget to focus and then find you have blurry shots after you download the images. The best course of action it to take multiple shots – and tap in between each one or two- that should assure at least some in-focus shots. 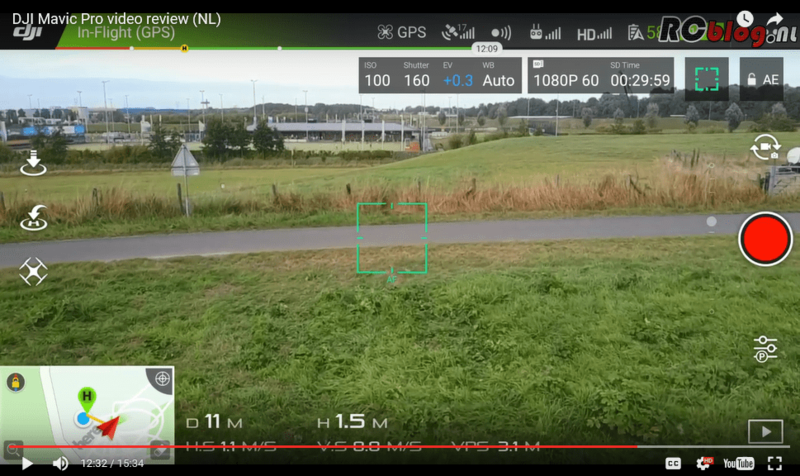 At very close ranges with good lighting (low or mid-level…bright tends to blow out Mavic) – the Mavic can show a finer level of certain details. Here are a few comparisons of the Mavic Pro and Phantom 4 still photo performance. 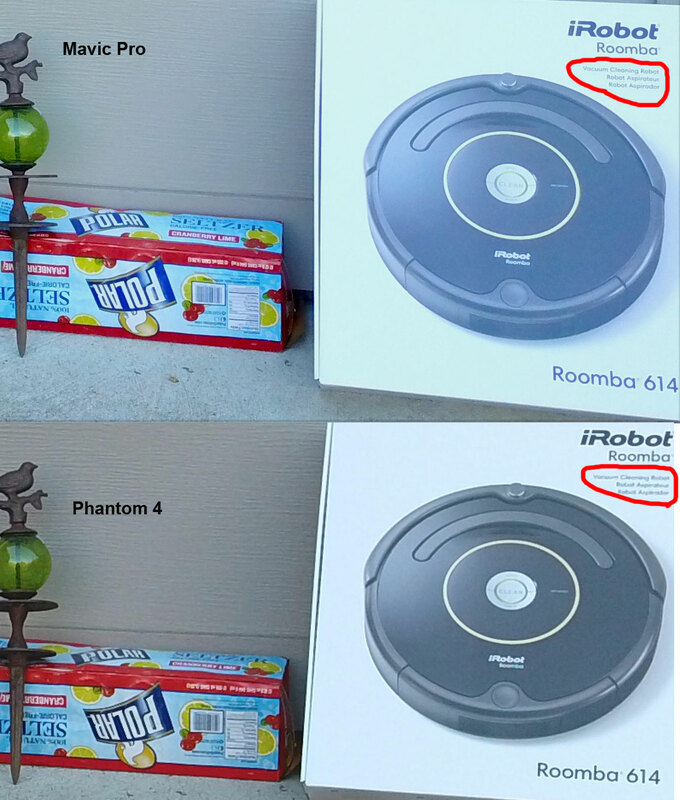 If you click on the image above and enlarge, you can read the text on the Roomba box with the Mavic Pro, but not with the P4. 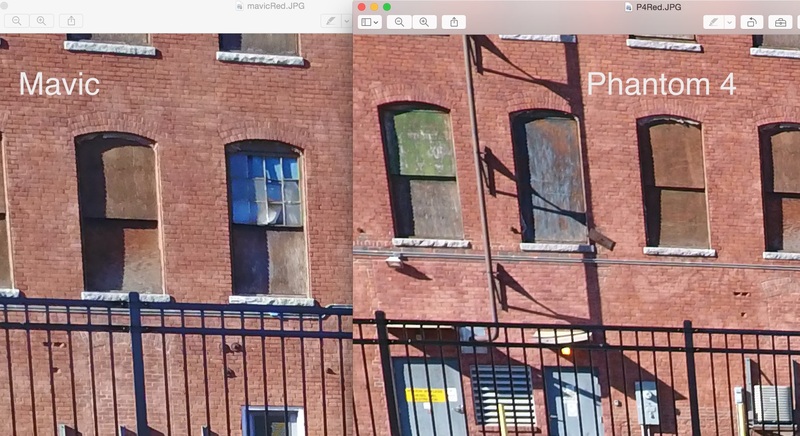 The picture below is a brick wall at a distance of perhaps 50-60 feet. I didn’t intentionally focus on this wall – but it did come out well as a background. Although harder to discern, I found the Mavic Pro (left) more realistic in the way that the brick is rendered. Mavic Pro (L) – Phantom 4 (R). Most cameras are effectively on an “infinity” focus once the object is far away – so that the focus at 100 feet and 1,000 feet is the same. In the case of the Mavic Pro Camera, pro photographers have determined this distance to be approx. blank feet. However, most of the other shots I took – what many might call normal landscape drone shots (from 150+ feet away….to the horizon) seem to favor the Phantom 4. Dynamic Range is defined as the ability of a camera to deal with a wide range of lighting and color conditions in a single photo. For example, a picture on a bright day may often “blow out” the blue sky and make it look white because the camera is unable to deal with the contrast between the sky and the land. The Mavic Pro has difficulty with scenes that require a lot of dynamic range – such as a large brick building with a blue sky and facing somewhat in the direction of a bright sun. The P4 renders the sky a nice deep blue while keeping the brick brown and other colors – whereas the Mavic blows out the sky and fuzzes the background (trees, hills, etc. below the sky). While it is possible that DJI will be able to improve the Mavic camera (in software), some of this is simply the trade-off for the convenience of having a small and lightweight camera. Mid-priced consumer camera drones have come a long way in the past 18 months. The still picture quality on many is sufficient for all hobby and light commercial (Real Estate, basic house inspection, etc.) work. Following is a list of many of the popular consumer camera drones and ranking/comments on their still picture quality. Note – this list covers drones up to $1200 complete. 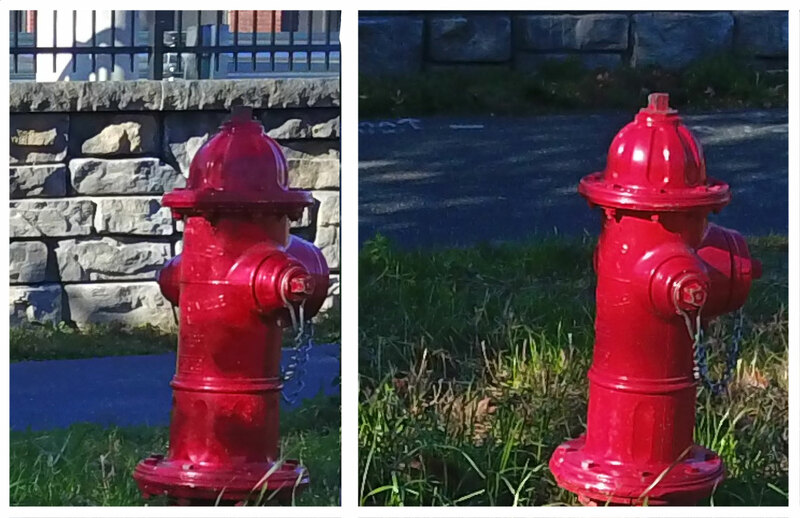 Best Still Picture Quality (these are in the same range – not listed in ranking order). Mavic Pro falls somewhere in between “Best” and “Mid-Level”. Note that DJI continues to hone the software that runs the Mavic Pro camera, so it’s possibly for it to improve even more. Yuneec Typhoon H and Q500 4k (Note – there seems to be some variance in camera quality with these machines – make sure you carefully check your model and have other photographers look at your pictures..Yuneec will fix and/or replace poor cameras). Tap to Focus brings new capabilities to the consumer drone world – especially for close up shots and certain details. It does require more input from the pilot/photographer, something most drone pilots are not yet accustomed to. it is our opinion that the average consumer buying mid-price camera drones will be happier with the fixed focus and better image quality of Phantom 4 (or other “best quality” still picture drones listed above) due to both the simpler operation (less chance for mistakes) as well as the better dynamic range. That said, a photographer with some basic knowledge and the ability to adjust settings and post-process can get usable – or even stunning – still photos from the Mavic Pro. In the end it’s often the scene itself combined with the eye of the photographer that makes all the difference. ALL of it fits into a small canvas over-the-shoulder bag which fit under the seat with room to spare. This is simply not possible with any other camera drone. If not for Mavic Pro I would not be bringing a flying camera on this (and many other) trips. I hope the above helps with your decision(s) and with your still photography. Note: Imagine quality is often in the eye of the beholder. A pro or semi-pro can coax better images out of a camera and a layperson. Also, current cameras are as much about software as hardware – and DJI (as well as others) continue to tune their systems. This article is meant as an overview and first look – your experience may vary.